Taking advantage of the warmer weather, Sunbury maintenance crews finished putting up the village holiday decorations on Monday. 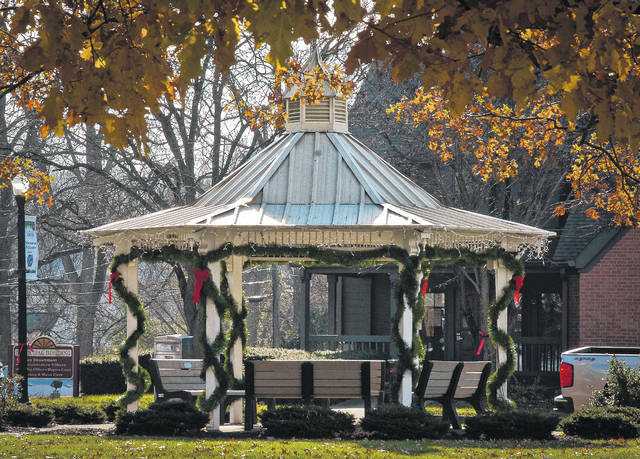 On the corner of the village square, the gazebo stands ready for this weekend’s Christmas on the Square scheduled from 4 to 8 p.m. on Saturday, Dec. 2. The holiday season kicks off Saturday in the Village of Sunbury when Christmas on the Square returns for its 2017 run. The celebration, sponsored by the Sunbury/Big Walnut Chamber of Commerce and its membership, is scheduled from 4 to 8 p.m. at Historic Sunbury Square. Local businesses on the square will host open houses throughout the evening. John Fox, executive director of the chamber of commerce, said Christmas on the Square is a testament to the positive relationship between businesses and residents in the Sunbury area. Fox said the estimated attendance in 2016 was about 7,000. A bigger crowd is expected this year. One of the highlights of the day is the Lighted Christmas Parade, scheduled to begin at 5:30 p.m. Saturday. Organizers said entries will be accepted right up until the parade begins, but earlier entries are encouraged. To enter the parade, contact the Sunbury/Big Walnut Chamber of Commerce at 740-965-2860 or www.sunburybigwalnutchamber.com. The chamber of commerce is hosting a craft and gift fair from 4:30 to 8 p.m. in the meeting room at its office, 39 E. Granville St. Following the parade at 6:30 p.m., Town Hall will be the site of the second annual cookie and candy contest. All proceeds will benefit Big Walnut Friends Who Share. The village’s tree-lighting ceremony is scheduled at approximately 7 p.m. on the square. Mayor Tom Hatfield, Village Administrator Allen Rothermel, and Santa Claus will officiate the ceremony. The Sunbury Lions Club’s Christmas tree sale, which also benefits Big Walnut Friends Who Share, will be open on the square. The Lions Club and Big Walnut Leo Club will conduct a coat drive on the square. Coats may also be dropped off at Sunbury Cleaners on Granville St. during the holidays. Visitors can meet with Santa and Mrs. Claus inside Town Hall and decorate Christmas cookies with the mayor and his family. Carriage rides around the square will be offered. To see the full schedule of events, go to www.sunburybigwalnutchamber.com.